King’s Day Amsterdam will be on the 27th of April, as it’s the King’s birthday that day! Will you be in Amsterdam on King Day? Then there are a few things you have to do that day. As this is a public holiday for the Dutch people and all day long there will be celebrations for the King. Prepare yourself to mingle in with the partying Dutchies! Important to know is that there are a few traditions when it comes to dressing up that day. And there are also a few activities that are quite traditional. It’s a typical Dutch party, so best is to try to be Dutch as a tourist! A typical thing is to wear something orange. Orange is the national color of The Netherlands. When the royal family is involved you’ll always see the color orange. A few days before King’s Day you can buy orange stuff everywhere. Buy an orange T-shirt, an orange wig or a small orange accessory. The Dutchies always put on some facial paint. This can be the flag of The Netherlands, red, white and blue. Or they put on some stripes of other colors. For this activity you have to get up very early! Around 09.00 there will be markets in several places in Amsterdam. On this market people sell there stuff. They sell everything! Clothes, pots and pans, old movies and maybe even furniture. On this markets you’ll see children giving a performance to make some money. You can look upfront where there are markets. Want to visit the biggest one? Visit the market in the Vondelpark. The Dutch know how to party! There will be loads of parties to find in the city. If the weather is nice, you can find parties on almost every square in Amsterdam. 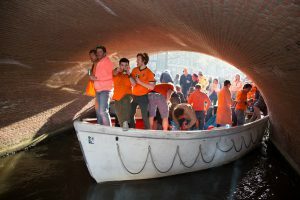 Want to have the typical Dutch King’s Day party? Visit the Noordermarkt in the citycenter. Do know that it gets very crowded here… But that’s also a part of the charm! The whole city is chaotic and everybody is out there celebrating.